Gross Domestic Product (GDP) relates to the total money value of all goods and services produced in one country's domestic territory in one fiscal (financial) year. The world's economy by GDP is the United States, with the value of its total output pegged at U.S.$15.2 trillion. China is in the second place with U.S.$7.3 trillion while India, with a GDP of U.S.$1.82 trillion, occupies the tenth place. GDP growth is represented in terms of percentage change over the previous period (it could be a quarter or a half-year or a year). The Indian economy is not doing well; today, I will not get into the factors behind the slump in economic activity in India. From a peak GDP growth of 9.6% in 2007 to a likely growth rate of 5.7% this financial year, India's economy has seen a significant fall in growth rate. 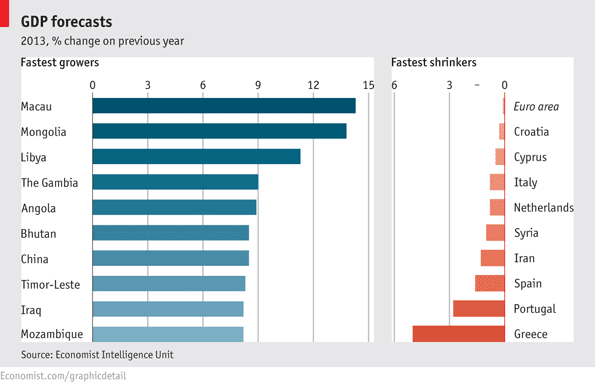 So, which countries will be the biggest growers and shrinkers in 2013? The Economist has an infographic on this interesting issue. Unsurprisingly, China is the only country among large economies to feature in the list of the fastest growers while debt-laden Greece will see its economy contract by almost 6%.